UK Recession Watch- Britain’s Great Depression? The purpose of this analysis is to map out to the trend of the UK recession for 2009 and 2010 in terms of depth, the bottom and the potential recovery. The most recently released GDP data shows that the UK economy actually did fall off of the edge of a cliff during the fourth quarter of 2008 by contracting by a shocking 1.5% GDP. This compares against the governments recent forecast for 2% GDP contraction for the whole of 2009 which paints a picture of gross under estimation of the actual extent of the degree of economic contraction that is taking place at this time, and hence the adoption of the easy going terminology of “Quantative Easing” to hide the truth of money printing on a scale that could bankrupt Britain, the evidence of which has been played out in the currency markets with sterling’s fall to a 23 year low against the dollar, a fall of over 30% in barely 6 months. The fourth quarter GDP crash of 1.5% is far higher than expected and explains why the government panicked as evident by the deep interest rate cuts from 5% to 1% in just 4 months. The rate cuts are in addition to the £1 trillion banking sector bailout liabilities. The rate of contraction at 1.5% per quarter implies an annualised collapse in the UK economy of 6% which would amount to loss of national income of £72 billion, against which the government has so far committed £40 billion in the form of tax cuts, industry support and stimulus packages. However the deviation of the trend for 2.5% growth per annum puts the gap at an additional £30 billion per annum. The £1 trillion committed towards halting the banking sectors collapse on face value seems like a huge amount that should kick start lending, however this should be set against contraction of an estimated 30% of the UK credit market or £1.2 trillion as distressed foreign banks pulled the plug on UK operations, on top of which we have had housing market deflation of £250 billion, and stock portfolios erasing a further £400 billion, which sets the £1 trillion of injections and liabilities against deflation of an estimated £1.85 trillion. The recession looks set to run throughout 2009, with the consensus view forming pf the opinion that the recession will be the worst since the Great Depression of the 1930’s during which time the UK economy contracted by 10%, the question now being raised is whether Britain is heading for its own Great Depression on a scale worse than that of the 1930’s ? Britain’s GDP during the 1930’s Great Depression fell by 10%, which on face value compares favourably against that of the United States that saw GDP contract by 30%. However unlike the United States, Britain did NOT boom during the 1920’s on the contrary the 1920’s was a period of stagnation that started out with the Depression of 1918 to 1921 that saw GDP fall by 25%. Therefore Britain’s Great Depression in fact started in 1918 and did not end until 1937 and therefore lasted nearly 20 years. However in today’s economy, Britain is coming off of a 10 year+ boom, therefore even a 10% contraction would not be on the scale of what Britain experienced during its Great Depression. However the argument could be made that having enjoyed a boom, Britain subsequent bust will unwind much of the gains made during the past 10 years as the United States experienced during the 1930’s, therefore this suggests economic contraction on a greater scale than that of the 1930’s, especially if protectionism takes hold which was the nail in Britain’s economic coffin during the 1930’s. British GDP (AMBI) at the end of 2008 is estimated at £1.275 trillion, against £1.267 trillion at the end of 2007. However sterling has collapsed against major global currencies by 30% or more, which translates into a real terms collapse in the countries GDP of 30%, i.e. 2007 GDP of $2.7 trillion has now fallen to $1.8 trillion a collapse in GDP of over 30%. The Government, Bank of England and FSA are failing in their primary duty which is to preserve the purchasing power of the currency. Therefore whatever is the conclusion of this analysis in terms of sterling GDP contraction during 2009, what readers need to remember is that the real purchasing power of Britain’s currency loss of 30% means that the countries GDP has already been sacrificed in lieu of hoodwinking the electorate into believing that things are not as bad as they actually are. Manufacturing was supposed to the save the economy from the economic bust in the light of sterling’s 30% devaluation, however given the collapse in global trade and demand which has put paid to that false assumption, as I pointed out over 6 months ago, sterling’s fall will not benefit Britain as the manufacturing base of the country has shrunk to such as small sector of the economy that it cannot hope to offset the Financial sector’s depression which once contributed more than £40 billion in profits a year to Britain’s bottom line, and now is consuming tax payers fund to the tunes of several hundreds of billions into an ever expanding black hole. To make matters worse the crash in the oil price has hit UK North Sea oil foreign exchange earnings and therefore contributes to sterling’s downtrend with an exchange rate drop of 30%+ that offsets a large part of the benefits of the fall in crude oil prices. In fact we may reach a point in the near future of rising petrol prices despite continuously depressed crude oil prices, which the analysis of 8th December ( Crude Oil Forecast 2009- Time to Buy?) concluded would remain depressed for the duration of economic contraction i.e. probably the whole of 2009. The February rate cut to 1% fulfills the forecast target for 2009 (4th Dec 08 – UK Interest Rates Forecast to Crash to 1% ). ,The next stop would be a similar Zero Interest Rate Policy (ZIRP) as that adopted by the United States that have cut their interest rate to 0.25%. 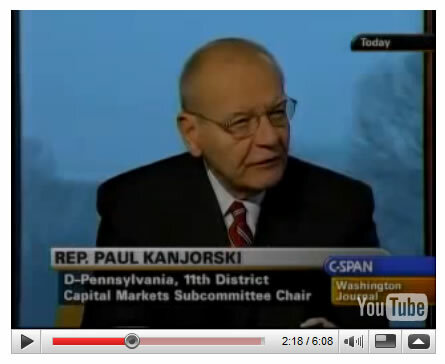 2 minutes and 20 seconds into this C-Span video clip, Rep. Paul Kanjorski of Pennsylvania explains how the Federal Reserve told Congress members about a “tremendous draw-down of money market accounts in the United States, to the tune of $550 billion dollars.” According to Kanjorski, this electronic transfer occurred over the period of an hour and threatened a further $5 trillion to be drawn out triggering a total collapse of the Worlds Financial System, which then prompted Hank Paulson’s emergency $700 billion TARP bailout action. Following Septembers close call with financial armageddon the governments of the world have been busy recapitalising bankrupt banks with tax payers monies, however the $500 trillion derivatives monster continues to deleverage and thereby implying that the risks of financial armageddon have only marginally improved on September 2008. There still exists the high potential risk of financial and economic collapse that would be accompanied by extreme currency market volatility. The shot-gun wedding between HBOS and LLoyds TSB last September in the amidst of the financial markets panic following Lehman’s bankruptcy to prevent another Northern Rock nationalisation is increasingly blowing up in Lloyds TSB’s face as yet again the reassuring words that bankers say one week turn out to be completely untrue. The Lloyds Chairman was congratulating himself barely 3 weeks ago of how the takeover would result in cost savings of £1.5 billion per year. With today’s announcement of a £10 billion loss by HBOS for 2008 shatters the Chairman’s illusion and Lloyds TSB’s balance sheet, as ever it will not be the bankers that pay the price but the tax payer. Already the UK Tax payer has pumped in capital injections of £18 billion into the LLoyds TSB HBOS group. The Lloyds TSB share price crashed by nearly 50% on the news to close at just 61p valuing the bank at just £10 billion, which is set against UK Tax payer capital injections of £18 billion which therefore values tax payers £18 billion investment at just £4 billion, or a £480 loss suffered by every UK tax payer. As I have warned several times over the past 6 months, the government propaganda of actually making a profit on these capital injections into bankrupt banks is an illusion which is now being borne out. Given the size of the HBOS and Lloyds TSB loan book, then that £10 billion loss is just the tip of the ice berg as 2009 will turn out to be a worse year than 2008 in economic terms as £10 billion of share holder equity cannot hope to defend against a loan book well in excess of £1 trillion, where even a further 1% loss due to bad debts would equate to more than total shareholder equity, and given the crash in UK house prices of 20% to date with a further 18% expected as per the UK housing market forecast, I cannot imagine how the bank can hope to survive in its present form. Many customers holding accounts across the two banks are worried that they are now unnecessarily exposed in terms of the FSCS £50k guarantee per financial institution. In this respect I have some good news in that the guarantee is per licence, and as HBOS retains a separate licence to Lloyds TSB which means that savings are guaranteed at £50k per person per bank i.e. a £100k guarantee across both banks. The 30 million or so customers of the giant UK retail bank will experience a deterioration in the quality of service as costs are cut and the number of staff that services the client base is significantly reduced this means less branches and less counter staff and therefore longer branch queues and greater difficulty in resolving account issues. Also the merger of the two has yet to be processed in terms of combining operations that was purported to save £1.5 billion per year, therefore expectations are for much disruption in client account operations especially where queries requiring manual intervention to be resolved. The banks are bankrupt ! The only things keeping them alive is tax payer moneys in the form of capital injections and loans that are now nudging above £1 trillion. The only real solution as I highlighted last November ( Bankrupt Britain Trending Towards Hyper-Inflation?) is for the systematic nationalisation of all of the retail banks, where each bank is MADE INSOLVENT, then the profitable assets nationalised and quickly restructured with new competent management and re-privatised with clear limits on its business plan so as to avoid trading in any Securitized debt and a ban on any money market borrowings which are the prime reason the banks are now exposed to bankruptcy. Other controls should be placed on pay limits across the group so as to prevent the culture of bonuses that has destroyed the banks. Also retail banks should always be limited to operating within the means of their depositor base, which is how 99.9% of the public assumed was the way they operated. IMF Revises UK GDP Forecast Again. The IMF has revised its GDP forecast for the UK economy for 2009 from -1.5% (November 2009) to -2.8%, and the forecast for 2010 is now +0.2%. The forecast still seems overly optimistic in the light of UK fourth quarter GDP contraction of -1.5%. The IMF has a good track record of being WRONG, overly optimistic forecasts that are continuously revised lower. Treasury figures suggest that the credit crunch will cost the Exchequer an ongoing 3.5% of national income (or a little over £50 billion a year in today’s terms) in lost tax revenue and additional social security spending. This excludes any long-term impact from the Government’s interventions in the financial sector, although even a large one-off loss adding to public sector debt should increase the ongoing cost in extra borrowing relatively modestly compared to the impact already reflected in current Treasury forecasts. In the PBR the Treasury signaled spending cuts and tax increases starting in 2010–11 and raising 2.6% of national income (£38 billion a year) by 2015– 16. If the public finances evolve as the Treasury hopes, this tightening would have to remain in place until the early 2030s before debt returns below the ceiling of 40% of national income Gordon Brown set as one of his two fiscal rules in 1997. So there is no prospect of a Government being able to readopt these rules any time soon. We hope they will be reformed in any event. Unfortunately, the Green Budget does not expect tax revenues to grow as strongly as the Treasury hopes over the next few years. In the absence of any additional spending cuts or tax increases, we forecast that the Treasury would have to borrow 1.5% of national income more in 2015–16 than it predicted at PBR time – even if the economy performs no worse than expected in the PBR. This would take public sector net debt above 60% of national income, from where it would decline only very gradually over subsequent decades. The key point is that the IFS states that the Uk will run a 1.5% budget deficit until 2016, and UK debt is not expected to return to below the ceiling of 40% of GDP until 2030 from a rate above 60%. This therefore supports my scenario that after the recession the UK will be heading for many, many years of stagflation. The CBI – The UK’s leading business group predicts the recession, which began in the third quarter of 2008, will last throughout 2009. The economy is expected to contract by 3.3 per cent and unemployment will reach close to 2.9 million by the end of the year. After six quarters of negative growth, the economy is expected to stabilise early next year with the recovery building throughout 2010. The CBI predicts the economy will contract by a cumulative 4.5 per cent over the six quarters of negative growth. GDP growth for 2009 has been revised down from -1.7 per cent in November to -3.3 percent. In 2010, GDP growth is expected to be 0.0 per cent. The impact of the recession and the fiscal stimulus will take a toll on the public finances with net borrowing for 2009/10 expected to reach £149 billion and £168 billion in 2010/11, which represent 10.6 per cent and 11.8 percent of GDP respectively. The CBI is clearly following hot on the heels of the IMF in doubling its rate of contraction for the UK economy from Novembers -1.7% to now -3.3%. The key point here is the CBI now recognises that government borrowing is set to soar for the tax years 2009-10 and 2010-11 totaling £317 billion, up £100 billion and now virtually identical to my forecast of November 2008 of £314 billion, did the CBI read my forecast ? UK Money supply M4 (blue) has risen sharply from the 10% targeted low of mid 2008 to the current level of 16.6%, on face value this is highly inflationary and has been taken by many economists and market commentators to suggest much higher forward inflation. However the money supply adjusted for the velocity of money which takes into account the state of the economy as a consequence of the credit freeze tells a completely different story. The UK economy is now in extreme real monetary deflation of approaching -15%. The leading indicator of the implied money supply, is suggesting recent deep interest rate cuts will lift future money supply growth out of extreme deflation, however it will still be far from supporting the levels north of 15% which accurately forecast forward inflation during 2008. The Bank of England’s quarterly inflation report forecast UK inflation of just 0.5% in 2 years time, with the UK economy now forecast to have fallen by GDP 4% by the middle of this year. It was not so many months ago that the Bank of England was forecasting growth of 2% for 2009. Unemployment – which hit 1.97 million yesterday – will rise further and house prices will continue to fall in the coming months. My commentary during the summer months of 2008 seems to have been proved accurate in that the BoE MPC at those monthly meetings remained paralysed by the fear of inflation and more or less sat sipping tea and conversing about the weather whilst the economy continued to burn towards the fourth quarter crash. What is the Governments Solution ? Quantative Easing aka Printing Money – The consequences of which are that Britain is at increased risk of bankruptcy as I first warned off in April 2008 following the first print run of £50 billion by the Bank of England and reiterated on a near monthly basis since ( archive ), with the most recent article ( UK Interest Rates Crash to 1% New Record Low) updating to the current position of Britain’s path towards bankruptcy. FSA – Who Should Regulate the Regulator? To illustrate the point in how wide the gap is between competent regulation of the UK banking system and how it is actually being regulated by the FSA, not just before the credit crisis broke in August 2007, nor in the immediate aftermath which witnessed the run on Northern Rock Bank, but to this very day some 18 months on as witnessed by the resignation of Sir James Crosby, Gordon Browns own appointment as the Deputy Chairman of the FSA on allegations that during his tenure as the head of HBOS (Halifax), he sacked Paul Moore due to the alleged complaints he had made about the banks risk taking that had not been properly minuted at HBOS board meetings. UK unemployment shot up by 48,000 for November 08 data to 1.97 million, and remains on target to bust above 2 million on release of data for December 2008. The unemployment claimant count soared by 11% for January to 1.28 million, up a shocking 129,000 on the month and confirming that the pace of unemployment is accelerating as the economy fell over the cliff during the fourth quarter. My original UK unemployment forecast based on July 08 data is for unemployment to rise to just above 2.5 million by April 2010, however the UK economy continues to deteriorate at an alarming rate with projections of a severe recession of more than a 4% GDP contraction implies that the UK is heading for an unemployment rate that could pass above 3,000,000. The jump in claimant count alone for Dec 08 and Jan 09 totaling 226k implies sharply higher unemployment for December and January, this despite the fact that he unemployment statistics are heavily manipulated to under report true unemployment which would be nearly 6 million higher if all those of working age (16 to 64) were included in the data. The real number of unemployed in the UK now stands at 7.86 million for November as the below graphs illustrate, the actual dip in total inactive is due to net migration as eastern european workers are apparently returning home in the face of increasing difficulties in the UK labour market. The indepth analysis of November 2008 illustrated why Gordon Brown is well on the route towards bankrupting Britain as the liabilities by 2012 will exceed £3.5 trillion from £1.5 trillion at the end of 2007, as the prime consideration for the Prime Minister is to win the next election at clearly ANY COST. The above liabilities do NOT include the £5 trillion of additional liabilities should the government be forced to nationalise virtually the whole banking sector. However, again people need to realise that the future gets discounted in the present, which is why the Bank of England, Treasury and Government policy makers do not comprehend that they cannot embark on the route towards £3.5 trillion plus of liabilities without the market reacting by selling out of the currency long before the country arrives at the debt destination. The effect of this is to make the current crisis far worse as the market seeks to discount the over 80% of the £5 trillion banking sector debt which is denominated in foreign currencies. Therefore the facility to inflate out of debt through “Quantative Easing” does not work, as the repayments have to be made in foreign currencies against which the countries debt burden rises as the currency falls and therefore puts Britain’s banks under greater pressure. The impact on the economy is deflationary whilst import prices rise thus suggesting a stagflationary outlook or worse. Workers In revolt, What’s the Answer ? In Britain workers have been in revolt against foreign workers shipped over from mainland Europe when their exists a mass of domestic unemployed labour. Britain’s free market attitude towards the labour market whilst working well during the boom times and in a level playing field, however what exists in much of Europe is not a level playing field with labour restrictions and subsidies increasingly becoming the norm. Take steel workers, in Yorkshire, Corus has announced 8700 job losses whilst in Holland 6,500 Corus steel workers receive 70% of their pay from the government. Off course this is one of the benefits of being in side the EURO which allows one to get away with such action by a country such as Holland without paying the price in terms of currency collapse. Whilst this is a help in the short-term however as the 1970’s and 1980’s illustrated supporting loss making industries in the long-run is the sure fire way towards economic stagflation. Therefore whilst there is undoubtedly much pain in store amidst a global economic downturn, there is no long-term advantage towards subsidising zombie industries for which demand is collapsing. It would be better for the government to pay for the re-training of workers for new technologies and industries that will conqueror the world coming out of recession then keep them stuck in industries in terminal demise. Conservatives Whistling in the Wind – The conservative party, as embodied by Kenneth Clarke seems to understand the problem even less than the labour government by calls for the underwriting of car loans to support the auto industry. The flaw here is that 86% of cars bought into the UK are imported therefore such an exercise would for £1 underwritten, 86p would be supporting foreign manufacturers. Collapse of the Euro ? Many commentators are contemplating the death of the europe due to countries with the Euro zone pulling in opposite directions such as Ambrose Evans-Pritchard who has apparently declared war on the Euro. I would happen to guess that the vast majority of these Euro doom commentators FAIL to understand or conveniently ignoring that had countries such as Ireland been outside of the Euro then they would already have collapsed Iceland style. Therefore the current crisis has in effect strengthened the Euro domestically regardless of what the rate does against the Dollar and other currencies. Domestically there is fear amongst many of the smaller countries within the Euro of what would happen to them IF they were outside the Euro and therefore the risks of a Euro collapse are vastly exaggerated. On the contrary countries such as Iceland who were vehemently anti Euro will be lining up to join the Euro as soon as their economy has Stabalised as the risks of being outside the Euro are infinitely greater than being in the Euro. Right across Europe Euro Skeptics have been sidelined by the collapse of the banking system that emanated out like a contaigent form the United States as every countries greedy banks sought to capitalise on the collatorised debt bubble. Clearly the Euro has been a life saver to many small countries under which umbrella has allowed the countries to undertake extreme measures that would not have been possible outside of the Euro right across the continent. From Ireland guaranteeing 100% of bank deposits, to Holland and many other countries subsidising wages upto a rate of 70% to keep workers employed. Unfortunately for Iceland, their own banks extreme level of greed and the populations fierce independence has led to the destruction of that economy. One of the primary reasons why the 1929 crash resulted in the Great Depression was because of the rise of protectionism and the collapse of global trade. Demonstrations and many heated discussions are taking place right across the developed world to protect workers from foreign labour, more so in countries with huge trade deficits that have effectively exported their manufacturing base abroad i.e. the United States and Great Britain, against these are countries that rely heavily on exports such as the fast developing countries of China, India and developed counties of Germany and Japan. The arguments on both sides are convincing. My own personal take is that there should be a level playing field, if there is then everyone wins, if there is not then one side loses and the other side wins. Unfortunately we are NOT living in a era of a level playing field, this is particularly true where China and other asian countries are concerned as they seek to manipulate their currencies lower and thus interfering with the normal working of the market that will tend to correct trade imbalances. Clearly the zero interest rate policy is a response to this in that the western governments are in effect punishing countries that seek to manipulate their exchange rates and therefore subsidising western budget deficits. However the severe recession itself will go a long way to correcting unsustainable trade imbalances as global trade collapses. Headline retail sales bounced strongly in December rising by 2% to an annualised 3.7% as distressed retailers slashed margins on stock to avert bankruptcy amidst price cutting in the wake of heavily discounted stock in the closing down sales of major retailers such as Woolworth’s , Zavvi and Adams, that collectively account for some 50,000 jobs. The expectation that over Christmas and January retail sales activity ‘should’ rise due to discounting materialised as our European and American cousins boosted retail sales volume by benefiting from the 30% crash in sterling which means the already liberally advertised 20% discounts translated into a 50% discount for European shoppers, much as Briton’s benefited not so long ago from the cheap shopping trips to New York at an exchange rate north of £/$2.00. However as earlier analysis suggested that the fall in sterling will result in much higher high street consumer prices during 2009 as those retailers that have not gone bust seek to replenish stocks at much higher prices during 2009. This confirms analysis that the January Sales for Britons may prove to be more illusionary than real as the fall in sterling has already soaked up corporate margins. The above graphs illustrate the strong rebound in retail sales, both headline and real retail sales trend that has moved out of deep deflation. However as per the points mentioned earlier, it is highly unlikely retail sales volume will grow past the January sales season into February 2009 and March 2009, in the face of heavy job losses and retailers going bankrupt. The Council of Mortgage Lenders (CML) mortgage lending data released today shows a 49% crash in the number of mortgages granted to home buyers to just 516,000 which is the lowest number since the mid 1970’s property crash. There were 32,000 house purchase loans in December, a decline of 5% from November and the lowest level since monthly records began in 2002. Michael Coogan, CML director general, said: “The shortage of mortgage funding and reduction in the number of active lenders has reshaped the mortgage landscape in the space of a year. This low level of transactions is insufficient for the functioning of an efficient market. The CML data supports that of the British Bankers Association BBA which saw the total amount outstanding contract from £524 billion to £496 billion. However on a marginally brighter note mortgage lending for house purchases rose from record lows during December 2008, which implies that the flood of tax payers money amounting to more than £1 trillion, coupled with angry arm twisting pressure from both the government and Bank of England on the part or wholly nationalised banks such as HBUST , Northern Pebble , Bradford & Bunglers and RBF’d-up is starting to show at the very least a pause in the crash of the mortgage lending market, which helped to contribute towards a small bounce in the house prices for January 2009 that my next article will elaborate upon. A cheer went up amongst housing market participants across the land as UK house prices rose by nearly 1% in January 2009 as measured by the Halifax. However the government is throwing everything including the kitchen sink at the housing market to bring about a halt to the ongoing crash in nominal terms. The amount of money printed has mushroomed from the £50 billion of April 2008. that I warned was just the tip of the ice-berg that would soon mushroom into the hundreds of billions, we are now in the process of leaving the hundreds of billions behind and moving into the trillions, sums that seriously risk the bankruptcy of Britain. The February rate cut to 1% fulfills the forecast target for 2009 (4th Dec 08 – UK Interest Rates Forecast to Crash to 1% ). with the next stop a similar Zero Interest Rate Policy (ZIRP) as that adopted by the United States that have cut their interest rate to 0.25%. The deep cuts in interest rates whilst not wholly passed on have resulted in a fall in the economic rate of interest from over 6% in September 2008 to 3.54% today. This is having a positive impact on the affordability despite the recession and hence supportive of house prices in the short-term. The rise in UK house prices during January 09 brings a pause to the house price crash that is now into its 18th month as the above graph illustrates as per the updated house price forecast that covers the trend into 2012 which projects for a total drop from peak to trough of 38%. However, as I have warned many times over the past 18 months, the government has in its power the ability to print money to bring nominal house price falls to standstill, this money printing is now quaintly termed as “Quantative Easing” so as to hide the truth and mask the continuing crash in house prices that despite the opinion of the mainstream press by the likes of Anatole Kaletsky and Ambrose Evans-Pritchard HAS put Britain on the path towards bankruptcy, as explained in the depth analysis of November 2008 – Bankrupt Britain Trending Towards Hyper-Inflation? While average house prices as of December 2008 are down 20%, in terms of price crash experience Northern Ireland tops the list at 35%, meanwhile Scotland continues to buck the trend by only registering a 6% drop to date. As the retailers go bust, financial institutions close or get down sized, and corporations go bust, this is going to lead to a crash in the value of commercial real estate that has already begun. The financial sectors of all of the countries of the world are already in a deep depression, which is leading to contraction across the whole globe against which governments are battling with ever larger stimulus packages, however Britain with its extraordinarily large financial sector was always destined to suffer the most, more so then other large developed european countries such as France and Germany. Therefore all the talk by Gordon Brown showed a great deal of bare faced cheek when he repeatedly stated how Britain was best faced to face the global economic downturn when in fact the exact opposite was true. The United States estimated bank losses are in the region of $2 trillion, UK bank losses are estimated to be $1 trillion, the only problem here is that the UK economy is only about 1/7th the size if the U.S., therefore British banks are exposing the UK tax payer to 3 times the losses as U.S. tax payers hence the reason why sterling is being dumped, which as much of the debt is denominated in foreign currencies has the effect of making matters worse as the value of the debt rises in sterling. The Bank of England and the FSA have a lot to answer for, exactly what have they been doing in their ivory towers whilst the financial institutions were busy turning themselves into hollow husks ? Global trade is collapsing and taking with much of the mainstream media hype that currency devaluation of 30% will boost the British economy. Yes we have hade a 30% devaluation in sterling, but who is going to buy our goods ? Who do we export to ? World trade fell over the cliff during the past 4 months, with shocking figures come through from right across the globe. Which means that despite the 30% devaluation, 30% of the value of Great Britain PLC wiped out for NOTHING, as our exports WILL FALL during 2009 NOT RISE ! ALL of the COST of devaluation with NONE of the GAINS, which illustrates the degree of incompetence right at the core of the institutions that are taking the decisions that are destroying Britain’s long-term future, and I fear far worse to come as Britain embarks on the next stage of currency devaluation that WILL lead to HIGH inflation ? How high well that depends on how much the government wastes on trying to bolster bankrupt banks. Today’s recession is experiencing a global meltdown in international trade, where literally economies are falling off the edge of a cliff right across the globe. What this means is that it is extremely difficult for a small economy such as Britain’s to buck the trend. Japan yesterday released truly shocking GDP data for the fourth quarter of 2008, the Japanese economy contracted by 3.3% which equates to an annualised rate of 13.2% which is on par with magnitude of contraction that is associated with an economic depression. All exporting countries are experiencing a crash in exports which fell by 14% in the quarter, as western consumers stop buying and start saving. Japans industrial plunged by nearly 10% in December 2008, down 20% on the year earlier. Japans government is expected to respond to the economic crisis by announcing a further stimulus package of more than $200 billion as the government again attempts to fight against the deflationary spiral that has kept Japan in depression for approaching 20 years. The collapse in the Japanese economy is ironic in a way as Japan in the same vane as many other asian countries was not exposed to U.S. subprime mortgage derivatives on the same degree as western banks, which during 2008 had given life to the argument of decoupling between the east and the West, however the exact opposite seems to be occurring with the asian exporting countries being hit harder than the consuming countries. Global Trade Green Shoots ? The Baltic Dry Index is a measure of global trade in terms of the price charged for chartering ships for the shipment of raw materials. Following the crash from a height of nearly 12,000 as the global economy fell off the edge of the cliff, the BDI has recently bounced, however as the chart shows the degree of recovery is insignificant compared to the preceding collapse, whilst a positive development the BDI needs to build on the rally to date to start to imply that the world economy in terms of international trade is hitting bottom, which I would expect to be reflected in 3rd and 4th quarter GDP data, which would imply a short severe global recession. This is also a potentially bullish signal for industrial commodities that have been decimated during the crash in global trade. In the final analysis, the projected course of the recession over the next 2 years is as illustrated by below graph in that the severe recession is expected to bottom at an annualised rate of -4.75% GDP in the fourth quarter of 2009, which will be followed by a recovery as the rate of GDP contraction improved as government stimulus measures announced to date and deep interest rate cuts as well as future stimulus kick into gear. The UK economic recovery is expected to continue into the fourth quarter of 2010 i.e. after the general election. The total recession from peak to trough is expected to see GDP contract by 6.3% and therefore this will be the worst recession since the 1930’s Great Depression. Unfortunately for the Labour government the economic cycle is completely out of sync with the election cycle as the economy is not expected to emerge from this severe recession until AFTER the next election as 2010 1st quarter GDP is estimated to be at an annualised rate of -3.9%, this therefore increases the probability of Labour losing the next election as the state of the economy is nearly always the primary determining factor for the electorate. However the Labour government will do its up most to battle against the election especially once GDP data shows contraction of more than 4% annualised, therefore the expectations are strong that the Labour government will sacrifice long-term growth for the short-term possibility of turning the economy around before the election. This also suggests that the 2010 recovery may not be able to take hold and therefore sets the scene for a weak 2011-2012, perhaps a double dip recession.